My husband and I frequently anchor here as we like to play “tourist” in Punta Gorda. This is where we live. 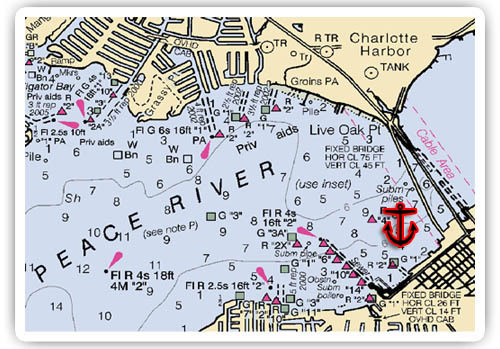 We also frequent several other anchorages in the SW Florida area in our 42′ Hunter sailboat. This anchorage happens to be one of our favorites. Punta Gorda is VERY boater friendly and the free bike loaner program makes it easy to get around in the downtown area. The Harborwalk is a multi-use walkway that extends from Fishermen’s Village marina and shopping district all the way up to the Justice Center. There are several restaurants, shopping and places to see along the way. The wildlife is abundant here and there’s always a great show put on. I highly recommend this anchorage. Good holding, friendly people and great food and drink! John you are correct in that the bridge clearance is 42 ft. They picked the wrong spot for the mooring field. But otherwise Punta Gorda is the best. I have been going there since 2002 with my trailerable Rhodes 22 and it was too good to be true. Unknown, uncrowded, unspoiled and welcoming. I fear that now it is being discovered. Ironically, now that I have “upgraded” to a Catalina 310 I can no longer go down there from South GA…at least until I retire! Good article and good suggestions from Claiborne. It is great to see a city put out the welcome mat, and realize that they will benefit from being friendly to boaters. However, for us sailors it is too bad the 45-foot bridges block us from the mooring field area and heading further up the river, and south of the bridge is quite shallow quite far out. I have read reports that the bridges may actually offer as little as 42 feet of clearance. To add to the amenities of anchoring off the Punta Gorda waterfront, new floating dinghy docks are now available in the recently dredged “lagoon” behind the Punta Gorda Boat Club, just north of Fisherman’s Village. Would be a good idea to check with the marina since the schedule may be adjusted based on demand. We lived aboard in Punta Gorda for several winters and loved the town so much we bought a condominium here on the Peace River ( Emerald Pointe) where we keep our boat. There are some of us who stopped here while cruising and ended up buying a house. Dinghy to small beach just west of Best Western Hotel. Lots to do nearby.